Have you heard of the Eve V all-in-one laptop? Yeah I know, I haven't heard of it either that is until I read all of the written reviews published on various websites. Not your branded laptop that's made by the usual suspects, the Dell's, HP, ASUS, or even Microsoft. No, the Eve V ( V actually stands for victory) is a crowd source funded device manufactured by Eve-Tech which is small outfit that's unknown to many including myself. Usually crowd source funded devices such as this hybrid computer have a uniqueness to it that might have some stoke with curiosity and wanting to drop cash on such a project. So what makes this particular device so interesting? The company is dubbing the device as being the Surface Pro killer which is rather ballsy considering you have similar devices on the market, but the features on and within the Eve V may just justify such bold talk as the hardware and features closely matches that of what any Surface Pro variant have to offer and more. It could be reason why so many are peaked with interest to the point of many funding such project. The Eve V was the first computer to ever be posted on Indegogo and has up until this date raised $1.3 million. In closely examining the top tier Eve V variant, it sports latest Intel 7th Gen Core i7 Kaby Lake mobile processor. This CPU is made specifically for devices like the Eve-V as it doesn't expend a great of energy, components are kept cool and stable even under intense workloads. The RAM capacity is rather immense at 16GB, on the storage front, you two options, 512GB PCIe SSD or 1TB PCIe SSD giving you plenty of storage and since the drives is an SSD and using a PCIe interface its fast. 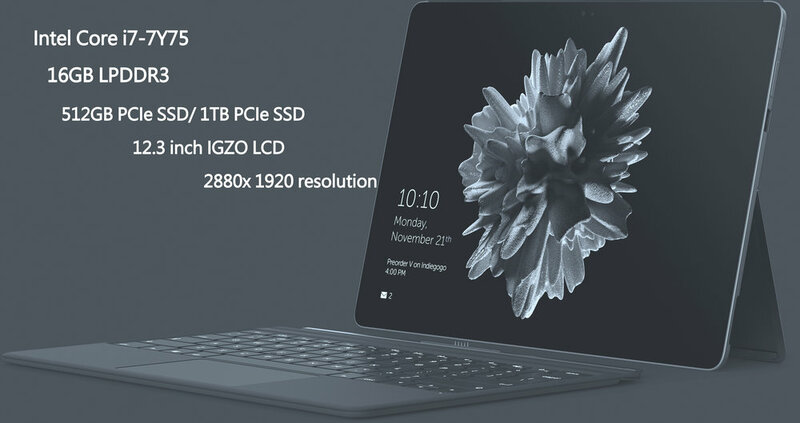 As you move further down the spec sheet, the difference between the Eve V and Microsoft Surface Pro start to varies with slightly more external ports, starting with a 2 full size USB-A 3.0, 1xUSB-C, 1xThunderbolt 3 USB C. External audio out is made possible with a 3.5mm jack. The 12.3 inch display is also differs from its Microsoft counterpart, instead of using regular LCD display, the Eve V uses IGZO (indium gallium zinc oxide) LCD display, the same display technology that's currently on the Razer smart Phone. Now if you know anything about the Razer smartphone its one of the first hand held devices that have a 120Hz refresh rate. Though there's no refresh rate listed in the spec sheet, it packing more pixels than the Surface Pro which comes in at 2880 x 1920 with an 1:1500 contrast ratio. In the sound department, the Eve V doesn't just have regular Dual-speakers, instead its implemented with Quad speaker (four speakers) and a Audio Jack Amplifier by TI for enhance sound. Two features that standout for me on the Eve V are the keyboard the finger print reader. The keyboard totally detaches itself from the computer while securely staying connected via Bluetooth 4.2, you can easily sync the same keyboard to other devices such as your smartphone and tablets, just as long as it meets the Bluetooth standard connection. The backlight keys can be customize to various color hues, white, red, green, blue, yellow and even pink. As I mentioned in the paragraph above that the keyboard can detach from the computer itself totally its morphing into a full fledged tablet with it having a capacitive touchscreen. The fingerprint reader lies hidden right beneath the power button. Honestly speaking, all latop and even smartphone manufacturers should adopt this feature. As claimed by Eve Tech, the actual biometric data is fully encrypted and safely stored on the computer. When discussing hybrid portables one must bring into the conversation the pen, or the V-Pen as Eve Tech likes to call it. The V-Pen have a special feature call the N-Trig touch interface and a metal-mesh touch panel with precise sensitivity. Expected pressure levels measures up 1024, allowing users unlimited abilities to fluidly sketch and draw subjects. The Eve V is an impressive device which on paper outweighs its competition in both hardware and features. For me the device biggest selling point is its sleek design and detachable keyboard. Thus far the Eve V has garnished some positive reviews, but is it enough sway mainstream consumers from buying hybrid devices from brands such as HP Dell and Microsoft? That remains to be seen.